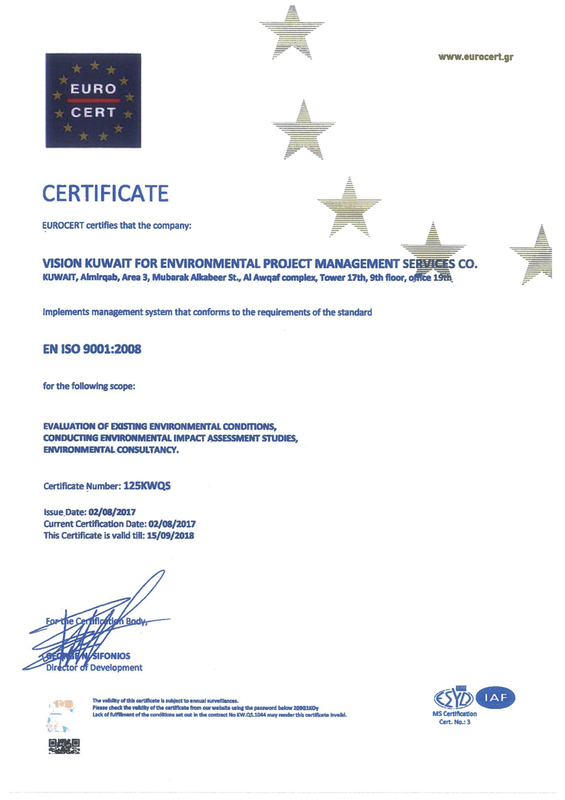 Vision Kuwait for Environmental Project Management Services Co. is a leading Kuwait environmental consultancy and services firm striving to bridge the gap between multifaceted environmental problems and their solutions. 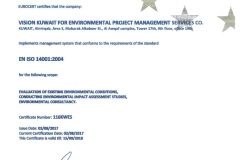 We are an ISO 9001:2008 & ISO 14001:2004 certified company, for Evaluation of existing environmental conditions, conducting Environmental Impact Assessment (EIA) studies and Environmental Consultancy. Vision Kuwait Company’s strength is our commitment to providing performance-based solutions. Flexible but focused, highly professional, yet cost effective, these solutions aim at striking a balance between being environmentally friendly and economically viable. Shared knowledge, teamwork, and enjoying a broad base of technical, environmental and business expertise enables us to offer our clients a dynamic, innovative and comprehensive package of environmental solutions and services. In addition, Vision Kuwait Company enjoys sound partnerships with several international consultancy firms, which makes it possible to tailor broad environmental solutions to projects funded by bilateral and multilateral donors. 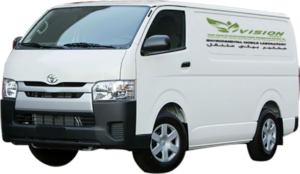 Vision Kuwait is proud to announce its Mobile Laboratory. We have a Fully Kitted Mobile Laboratory offering turnkey mobile laboratory solutions for environmental Air, Water and Soil Analysis. Understanding the significance, Al Khulifah Group started Vision Kuwait for Environmental Project Management Services Company. The company is registered with Kuwait EPA under Category A and also with KOC under Category 71A – ‘Environmental Impact Assessment’ (EIA) studies. 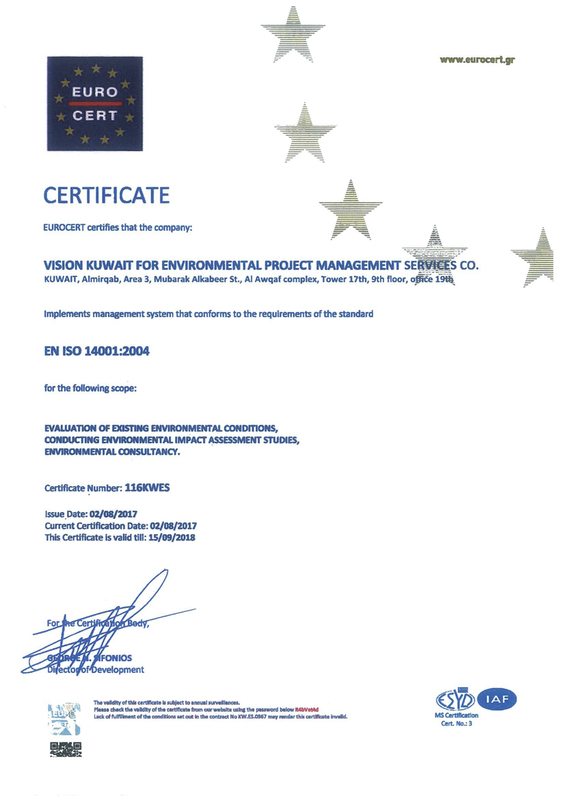 Vision Kuwait is a well-established Environmental Consultancy and Project Management Services Company, with team of experts have over 25 years of practical experience, bringing the latest technology from international companies to Kuwait. In addition, Vision Kuwaiti Company enjoys sound partnerships with several international consultancy firms, especially with EcoConServ from Egypt, which makes it possible to tailor broad environmental solutions to projects within and outside Kuwait. Al Khulifa Group’s focus on Health, Safety and Environment (HSE) is a cornerstone in its best practice policy. We believe, no progress can even be conceived unless the safety of employees and assets is maintained and guaranteed, with the HSE performance closely linked with progress potentials.